NWA Democrat-Gazette/CHARLIE KAIJO Horticulturalist Dana Torczon of the Bentonville Parks and Rec (from center left) and Scott Eccleston, board member of the Bentonville Parks Conservancy prune a tree, Saturday, June 9, 2018 along SE "J" Street in Bentonville. 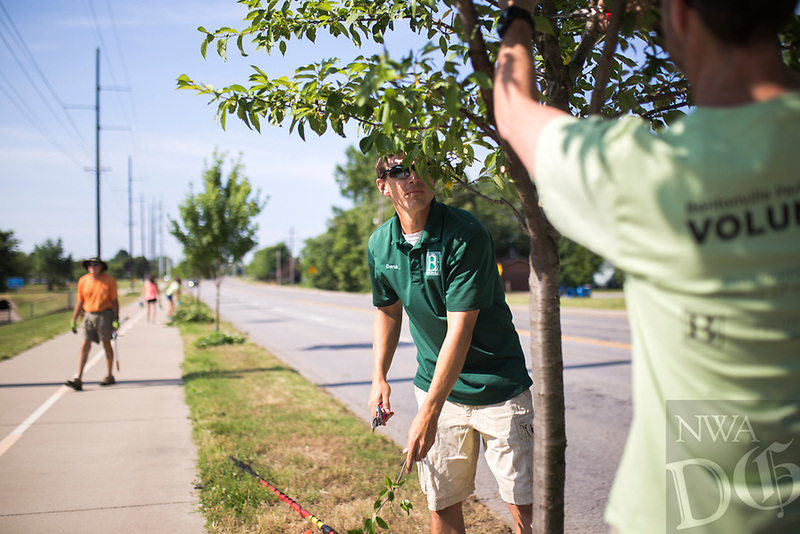 The Bentonville Parks Conservancy pruned the trees along SE “J” street, between SE 8th Street and HWY 102 Saturday as part of tree maintenance days that it will hold throughout the summer to help develop tree canopies throughout the city’s parks and trails. The Bentonville Parks Conservancy is a non-profit organization that works with the city to help develop and maintain the city tree canopy and parks. Part of their vision is to develop a volunteer work force that will meet throughout the year to work on tree maintenance as needed by the city and parks department. 14 volunteers showed up Saturday to help prune about 100 trees.